Calibration is the process or method of establishing an accepted and judicious standard by which overall employee performance is measured by taking away the impression of having biased and unfair reviews. Calibration makes it easier for managers to deliver honest but negative performance appraisals. It also has the benefit of exposing talented employees to a larger number of senior leaders. Calibration is a simple and well-structured appraisal system for performance evaluation. Rank employees objectively − It removes inconsistency and manager bias from your succession process to improve decision making. Identify top performers − Analyze employees on a two-dimensional grid of ratings, such as performance versus potential. Compare talent side by side − Evaluate talent across teams on dimensions such as work experience, education, competency, leadership skills, geographic mobility, and more. Streamline processes − Simplify your overall talent allocation processes, increasing the efficiency for everyone involved. Empower HR − Reduce the time required to manage calibration and succession processes, allowing more time for strategic activities. Managers can apply similar standards for all employees. Helps eliminate biases and prejudices. Enables the managers or the employer to find the best talent and allows to develop those talents and reward appropriately. Managers acquire different views of the work force and ascertain talent. Provides coaching for managers and peer managers discuss why some employees should receive training and development over financial compensation. The following illustration shows the calibration process for employee assessments. Managers use appraisal documents to assess their employees. For example, their performance, potential or competencies. If required, the employees also make selfassessments. 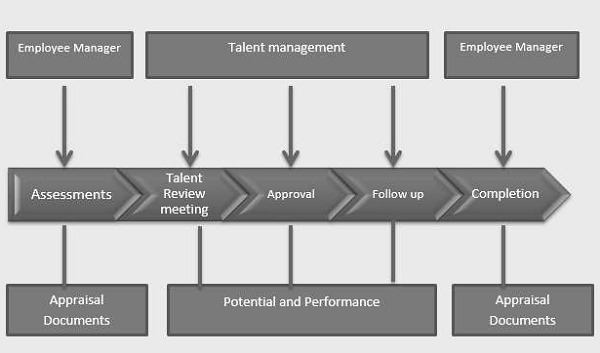 Talent management specialists organize one or more talent review meetings in which the assessments made by multiple managers are calibrated. Talent management specialists then update the appraisal documents with the values from the relevant talent review meeting. Managers inform employees about the assessments made in the talent review meeting and close the assessment process.